I was 18 years old, newly admitted to GW, and Googling everything from dining plans to Greek organization rankings to freshman housing. Eventually, I came across College Confidential, the one-stop-shop for all things college. On GW’s page, this alliteration flashed across my screen: Thirsty Thrusting Thurston. Thanks to my older sister, I had been privy to stories about college parties, the dubious conditions of freshman dorms and what the quintessential college experience was supposed to be. 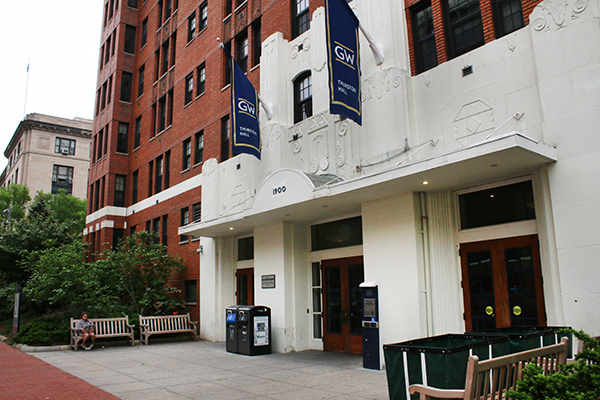 From that headline alone, it certainly seemed GW’s biggest freshman hall would live up to the hype. But I wasn’t altogether sure if I wanted my freshman experience to be filled with boisterous nights during finals week or the smell of pizza and vomit in the stairways. What sounded appealing to some – fans of “Animal House,” perhaps – didn’t seem like it would work for me. But I figured, one person’s freshman experience – however much he or she might have enjoyed it or how idyllic it might have seemed – didn’t have to be mine. So when I filled out my housing application, my roommate and I decided to live in Madison Hall. We thought the building’s central location and the guarantee of a double with our own bathroom was too good to turn down. Soon after, though, I started having doubts. In the days leading up to my arrival on campus, I began to think – erroneously, I know now – that everyone and their brother lived in Thurston Hall and that I wouldn’t possibly make any long-lasting friends at college if I didn’t live there, too. I had solidified my destiny: to live in a small, quiet hall far away from my peers. I was an idiot. Thankfully, syllabus week changed everything for me. My roommate and I went around to everyone on our floor and introduced ourselves. We went to Welcome Week events and experienced our first college weekend with trips to Dupont Circle and Georgetown. My first friends at college lived everywhere, from Thurston to Potomac House to the Mount Vernon Campus. My freshman experience probably wasn’t going to include parties right in my room, but that didn’t mean I wouldn’t have fun. Madison is by no means a hotel. At the ripe age of 70, it often feels like little has changed in the hall since it was built in the 1940s. During finals week this past semester, my roommate and I had our first real experience with the disadvantages of an older building: Our heater was on the fritz, making the room unbearably hot and humid. It felt not only like we weren’t a priority to FIXit, but that to them, we didn’t even exist. Suddenly, despite my early appreciation for Madison, I started to wish I was living in Thurston all over again. I felt like I was perpetually locked inside my dirty, leaking room, waiting for a maintenance worker who would never come, and just wishing I could hear liveliness around me. Instead, all I heard was silence and the endless beeping of the elevator. I had heard about the horrors of living in Thurston – not being able to sleep because it was so loud, having to live squeezed in with five other people, no sense of privacy – but I also couldn’t help but wonder how fun that might be. Even late into the semester, I still thought I might be missing out. But my fear of not making friends because I didn’t live in Thurston forced me to be more open in classes and introduce myself to anyone I sat near. And, while it may not be for everyone, going Greek gave me the opportunity to meet hundreds of people I wouldn’t have had the chance to meet otherwise. I learned so much about myself in those initial encounters with the people I now call my friends because they showed me I was confident enough to talk to anyone. There are days when I still question if my decision to live in Madison was the right one. When I’m getting ready to go out at night, there’s nothing I dread more than walking to meet my friends at Thurston in the freezing cold. But my first semester was filled with laughs, meeting new people and realizing how social I can be. If living in my isolated building was the impetus for me to get out and open up as a person, then thanks, Madison. Thanks for your leaking pipes, your elevator that resembles a tin coffin, your distance from Starbucks and for an amazing start to my college experience.